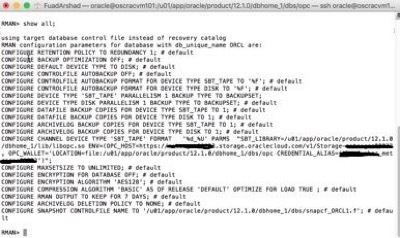 The Oracle Database Cloud Service allows for backup of an Oracle Database to the Oracle Cloud using Rman. Enterprise Manager 13c provides a very easy way to configure Oracle Database Backup Cloud Service. 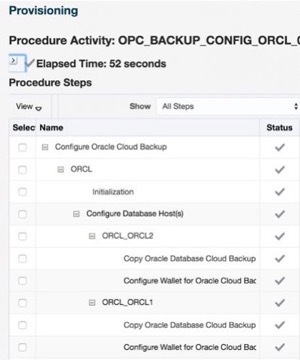 This post will walk you thru setup of the Oracle Database Backup Cloud service as well as running backups from EM. 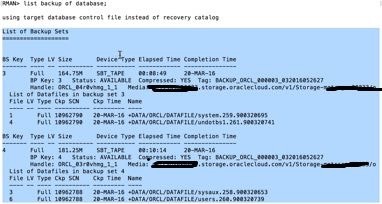 There is a new menu Item to configure the Database Backup Cloud Service (DBCS) in the Backup & Recovery Drop down. This will show you how to setup the Database Backup Cloud Service. If nothing was configured before you will see the screenshot . Once the Settings are saved . A popup will confirm that the setting have been saved. After Saving the Settings Submit the Configuration Job . This will Download the Oracle Backup Module to the hosts as well as configure the Media Management Settings. The Job will provide details and confirm all configuration is complete, and will configure this on all nodes of a RAC which can save a lot of time. We have now completed the setup and can validate by looking the Configure Cloud Backup Setup . This also has an option to test cloud backup as well.
. Lets ensure we have settings there and Checking in Backup Settings , The Media Management settings will shows the location of the Library , Environment and Wallet. 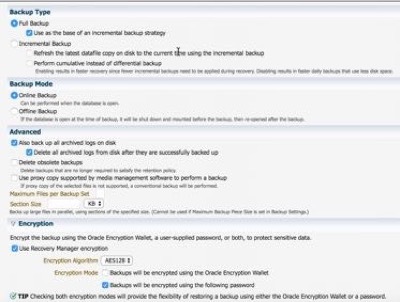 The Database Backup Cloud Service requires all backups sent to it is encrypted. You can also validate this by connecting to rman on the command line and running a "SHOW ALL"
As you can see we have confirmed that the media management setup is completed and well as run a job to download the Cloud Backup Module and configure it. Now as a final Step we will configure a backup and run an Rman Backup to the Cloud. In the Backup and Recovery Menu Schedule a Backup . Fill out the pertinent setting and make sure ou either encrypt via a password or a wallet or both. The backup that i scheduled was encrypted using a password. Validate that the setting are right and execute the Job. You can monitor the job by clicking the View Job. The New Job Interface in EM13c is really nice and allows you to see a graphical representation of execution time as well as a log of what is happening side by Side like below. There are a couple of things that i didn’t show during the process . Parallelism during a backups is important as is compression. Enterprise Manager 13c allows for making the already simple process of setting up Backup’s to the Database Cloud Service much easier.